The mix of Chinese and British cultures is really an interesting combination. It always makes me laugh when I hear an Asian person with a British accent. But it’s the little things that are very similar to what I have seen in London: street signs, roads, arrows telling you which way to look at cross walks, etc. I started to get my bearings around the hotel on day two. I also had Italian food for dinner the night before and a Starbucks coffee in the morning. This helps me remember that this place isn’t totally different. On a side note, while I was sipping my coffee waiting for a ferry, I noticed a few things. Some customs must be very different here. I remember in Beijing that people were spitting snot everywhere on the street. I even was almost hit by an old lady. While I was sitting in the Starbucks, I saw three different people sneeze multiple times on the person in front of them on the escalator. Since it happened more than once, it couldn’t have been an accident. I feel that covering your mouth and nose while you sneeze is just common sense for health and just grossness reasons. But who knows, maybe it’s the norm here. I headed to Macau for a day trip on day two. The ferry from Hong Kong Island to Macau is pretty cool. It seats about 14 across in airline style seats. The ride takes about an hour. I wasn’t aware that after you buy your ticket you have to go to another stand and get assigned a seat. So I was late getting assigned my seat, but my luck continued and I got a bulkhead seat with lots of legroom. I hope this lucky streak lasts the whole trip. The seas were choppy that day my friends. I shouldn’t have drunk a large coffee just before getting on the boat. I was praying that I didn’t get sick, and more so the baby next to me. And it threw up. I don’t know what the parents expected after they started feeding it 15 minutes into the voyage. At least the mother had the good sense to grab a barf bag. THEY ARE CHANGING THE BABY ON THE SEAT NEXT TO ME! This is outrageous. There are bathrooms right around the corner! The fact that it puked and is crying was bad enough, but changing it on the seat next to me? Jesus. My luck ran out. No wonder they gave me this seat. I finally get to Macau. Once I got through immigration (good thing I brought my passport, didn’t know I would actually need it), I was scared they didn’t take Hong Kong dollars. So I went to an ATM to get Macau currency. I tried to just get a little, but I ended up having to take out $1000. The machine gave me two $500 bills. How am I supposed to break these?? The cab ride to Macau Tower cost about $28 and he wouldn’t take one of the bills. Fortunately, I still had some HK$ on me to pay. At least I have $500 to blow at a casino now. From the top and the bottom. 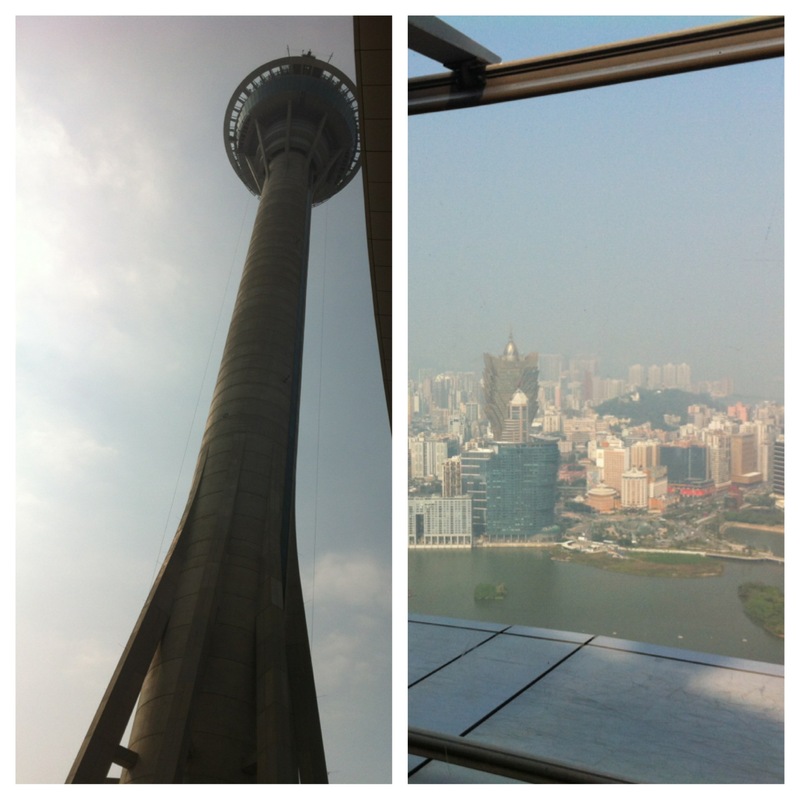 The Macau Tower is pretty cool. The observation deck is open air on top, and there is a ledge on the outside where you can walk along the edge. You can also bungee jump or controlled freefall off the top. Insanity. If you watch “An Idiot Abroad,” you know what I am talking about. Now I have heard that Macau is the Las Vegas of Asia, and boy where they right. I saw at least 3 Rolls Royce’s and a few Bentleys. One of the Rolls was a shuttle for a hotel. There are even branches of the Wynn and MGM casinos dispersed among the Portuguese and Asian ones. They are basically the same as in Las Vegas, but Asians LOVE baccarat. About 80% of the tables are baccarat. Could only find a total of 10 tables of Blackjack in the Wynn and MGM combined. I also didn’t see one craps table. 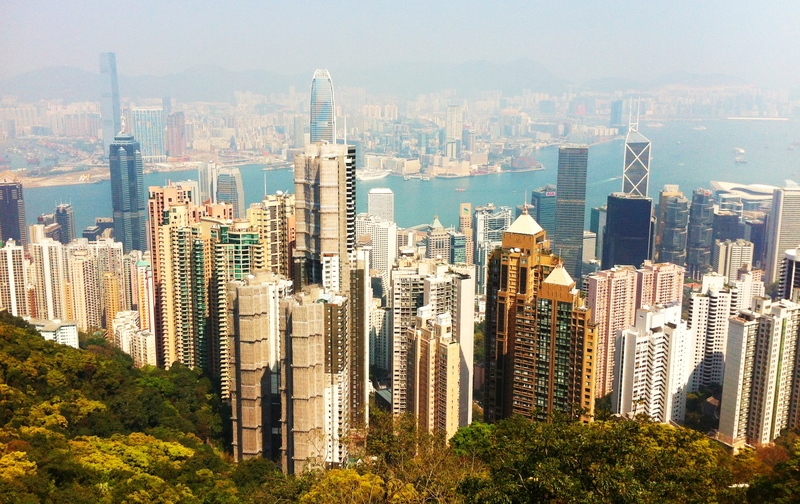 After losing some money and getting laughed at for struggling with noodles and chopsticks by the couple next to me, I headed back to Hong Kong Island. I witnessed an older woman typing a text on her iPhone. To do it she had a drawing pad instead of a keyboard and needed to draw the Chinese letters then select one from a group of suggestions. This seems a very tedious and inefficient method of texting. I’ve always been curious how texting worked over here. I took the tram to get to the top of Victoria’s Peak. It is sort of like a rollercoaster since it is so steep and on the rickety rails. I definitely am glad I waited to go to the peak, this is by far the clearest day I have been here for. Granted, it is still smoggy, but it’s better than before. Pictures don’t do the view justice. It’s much easier to see through the smog with your eyes than through the lens of a camera. The views from up there are fantastic. The lush greens from the mountainside contrast with the modern skyline nicely. That night I took a harbor cruise to see the Symphony of Lights. It is the world’s biggest lightshow with over 40 buildings on the skyline participating. The views were spectacular from Victoria’s Harbor, I wonder how they looked from the Peak? Tomorrow morning at 5:15am I am taking a cab to the airport. Not going to be fun. However my last day in Hong Kong was an unforgettable one. I am ready to move on to Thailand and Cambodia. 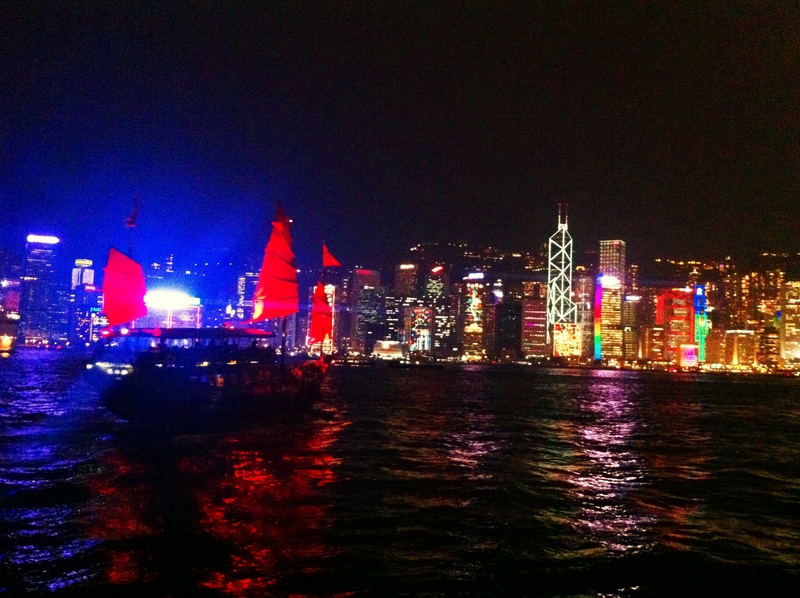 This entry was posted in Hong Kong, Travel, Uncategorized and tagged Hong Kong, Travel on February 26, 2013 by hanlont.